For decades, the PT-76 was Russia's dominant light tank, used primarily to support airborne units and as a reconnaissance platform. The tank eventually fell into disuse and was finally abandoned as potently armed IFVs took over its roles. However, in the late 1990's, Russia introduced its new light tank, the 2s25 Sprut-SD. While type classified as a self-propelled artillery piece, there is no doubt this vehicle is a light tank, armed with the same 125mm gun found on Russia's MBTs. In addition to heavy firepower, the 2s25 is airdroppable, much like the famous AMX-13. As a bonus, thanks to its roots in the BMD-3, the Sprut-SD is not only amphibious, but surf-capable as well, able to ply coastal waters as few other amphibious military machines can do. Included with this issue is the 2A45M Sprut-B, a towed anti-tank gun and the first towed artillery covered in the series. 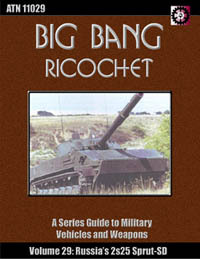 Also included is a detailed entry on the D-81 series of 125mm anti-tank guns, plus the extensive range ammunition that was developed by both Soviet researchers and the post-cold war Russian arms manufacturers.